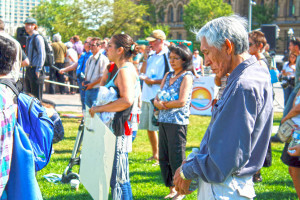 Inuit and non-Inuit alike marked World Suicide Prevention Day on Parliament Hill on Sept. 9 with an urgent message to government to take action against the crisis facing Inuit communities, where the suicide rate is 11 times higher than that in the rest of Canada. The major message was that a lack of support services in the north is leading to a huge number of Inuit, especially youth, taking their own lives. This marks the 5th year in a row that this day has been marked on the Hill by Inuit looking to draw attention to the decimation taking place in their communities. Mary Simon, the president of Inuit Tapiriit Kanatami (ITK), one of the six national Inuit or Aboriginal organizations putting on the event, talked of her personal experience with her niece’s suicide in March this year, and how these suicides affect everyone due to the small size and close-knit nature of Inuit communities. She identified the need for having support services in all 53 communities in the Arctic, not just the major centres, and the problems with even in some larger communities only having support in the form of a social worker, who ends up taking on additional tasks of mental health and crisis support, unable to provide all that’s needed and ending up burned out in a vicious cycle. She also stressed the importance of countering stigma around mental health issues, and the three elements required for successful treatment: proper diagnosis, suited treatment, and after care. ITK cites unpublished data from Health Canada that states the national suicide rate for Inuit is 135 per 100,000 people, as compared with 12 per 100,000 for Canada overall. The rate is among the highest in the world, approximately double that of the overall Aboriginal population in Canada, and it has been getting higher in recent years. More Inuit men than women are killing themselves, a majority are youth, and the average age is getting younger. ITK’s ‘Inuit Approach to Suicide Prevention’ backgrounder sheet details a number of factors contributing to high rates of suicide, including the results of colonialism and socio-economic factors, but high on the list is a lack of coping skills (seen in the number of post-relationship-breakup suicides among youth) and lack of access to mental health services. The need for mental health services is acute, especially to deal with addictions, says Watkins. “The biggest problem is alcohol and substance abuse. Addictions is killing the north and we need facilities. We need rehabs, we need mental health, and we need workers to deal with these people that want to get better, for the betterment of their children and our children and the young people around all of us. On the day of the event, another of the hosting organizations – the Honouring Life Network of the National Aboriginal Health Organization – released a video entitled, “Support” — positive Inuit youth programming in Clyde River, Baffin Island, which is available in both English (embedded below) and in the Inuktitut language.